If you're like me, you love beets but you don't often prepare them. They can be messy right!? They turn your hands red. They stain your cutting board and maybe even your clothes. And the thought of storing them in a normal storage container brings visions of a plastic container forever lined with beet markings. But I think we need to give beets a second chance. The pigments that give beets that rich colour are antioxidants that may provide health benefits. Beets are especially great in winter. They are energizing for your body and they're high in immune-boosting vitamin C, as well as fibre, manganese and potassium. I'm going to tell you how to roast and peel beets with minimal mess. We'll put them on top of a healthy mixed greens salad with other beneficial ingredients like avocado and pumpkin seeds. (Pumpkin seeds provide you with zinc to help you ward off colds this season!) 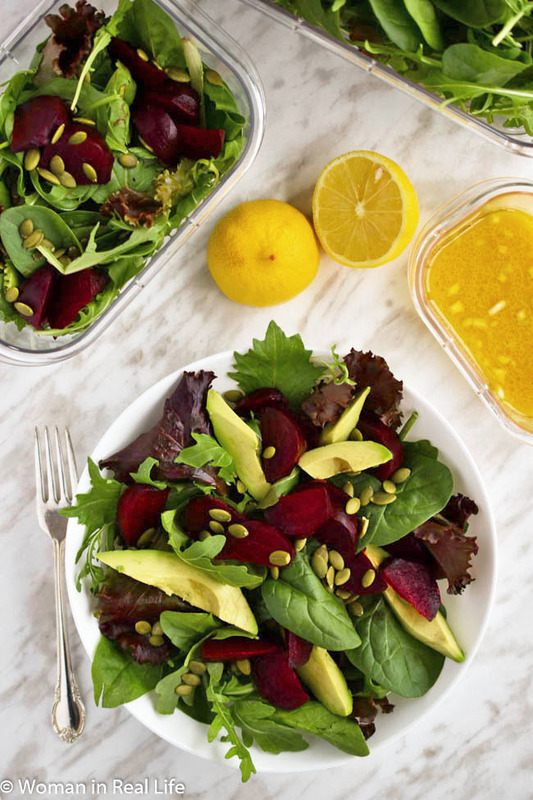 And we'll store our salad in Rubbermaid Brilliance storage containers, which are stain resistant and therefore not afraid of no beets! Although simple, this salad is pretty enough to serve to your friends for a special occasion. And you can take it to work with you for a tasty yet healthy lunch option. 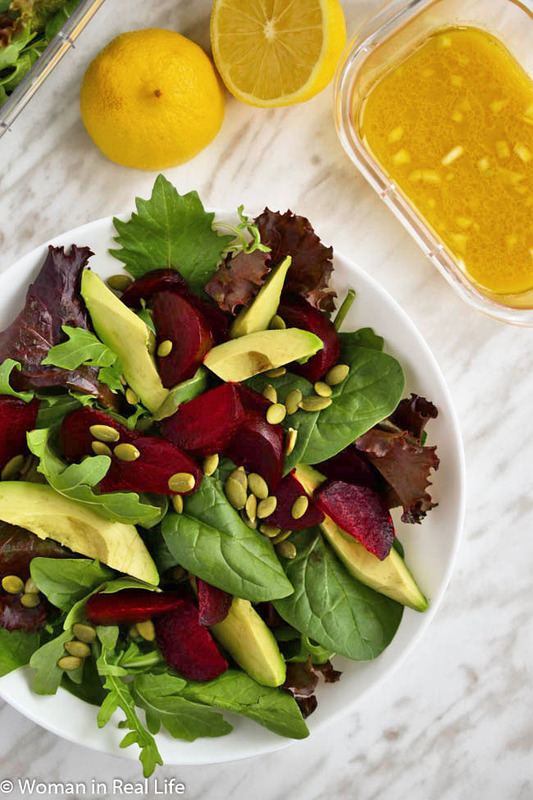 The beets are so vivid and lovely, the avocado slices add a nice, bright touch and the pumpkin seeds provide a pleasant crunch. I'm suggesting a simple apple cider vinegar dressing with fresh minced garlic for additional potential health-protecting effects in fall and winter. To roast beets without making a mess of yourself and your kitchen, start by putting on an apron...just in case! Preheat the oven to 450°F. Wash the beets and trim off both ends. Lay the beets on a sheet of tin foil. Wrap foil around the beets and roast them in the oven for 45 minutes or longer, until you can slide a fork easily into each beet. Any mess at this point is contained in the foil. While the beets roast, prepare the simple apple cider vinegar dressing - a mix of olive oil, apple cider vinegar, fresh minced garlic, dijon mustard, lemon juice and sea salt. This easy vinaigrette contrasts nicely with the fresh salad greens, offering a pleasant tanginess from the vinegar and a punch of flavour from the garlic. After that, all that's left to do is assemble your greens on plates or in food storage containers. I opted to buy a green salad mix with arugula already in it, but you could also start with a base of fresh arugula and build other salad greens on it from there. Arugula is not only packed with nutrients - it also has such a lovely shape and a nice, peppery flavour. 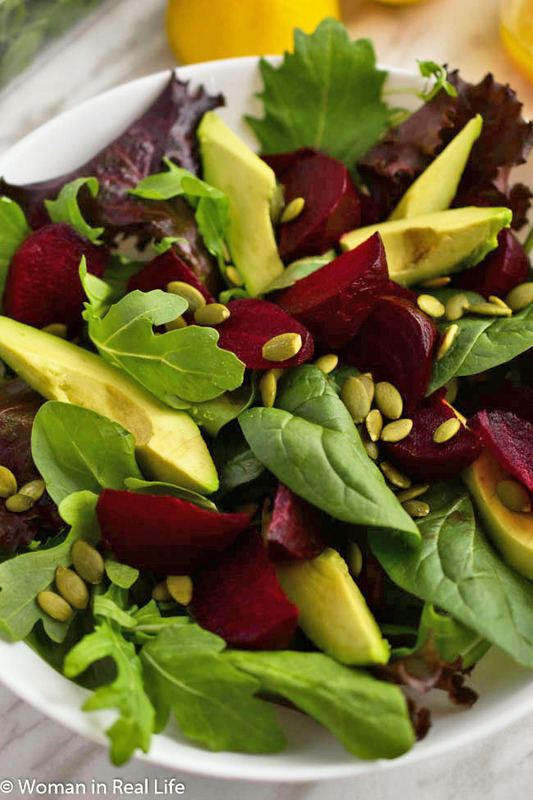 Add diced beets, pumpkin seeds and avocado and drizzle on dressing. So easy, yet this salad makes for a satisfying lunch. It would be outstanding served with a carrot soup too. If you are storing your salad for lunch the next day, omit the avocado for now and add it when serving. We rely on Rubbermaid food storage for storing our lunches, leftovers and snacks. 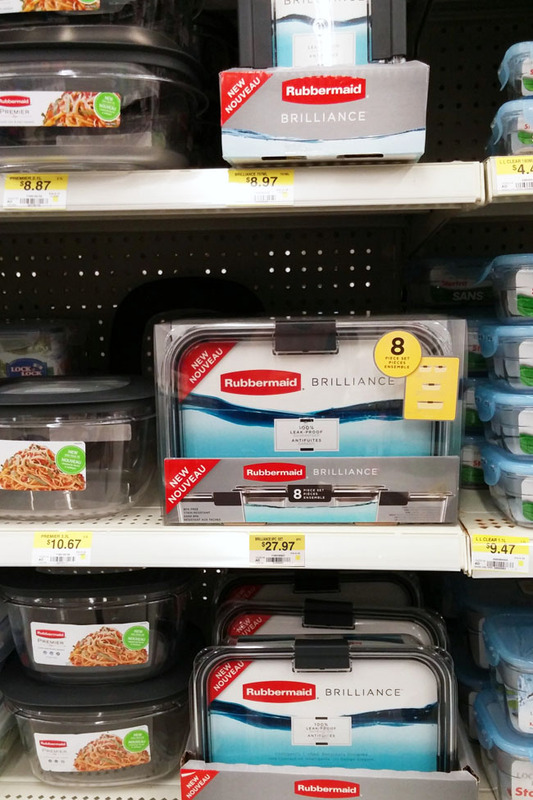 Now Rubbermaid has a new standard in food storage - their Rubbermaid Brilliance line. 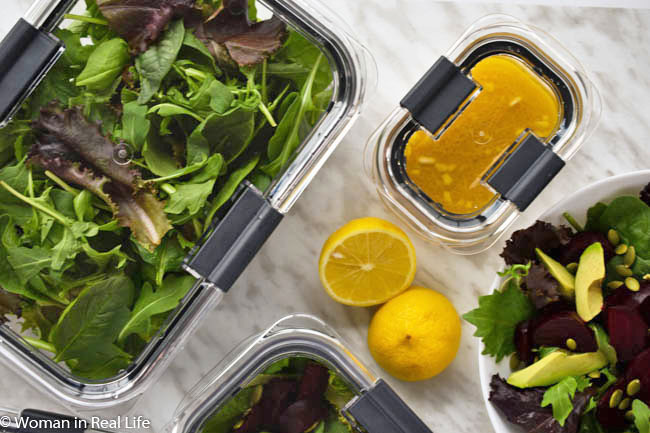 Rubbermaid Brilliance is 100% guaranteed leak-proof, so the small container (308ml) is great for storing your salad dressing. No nasty leaks in your fridge or lunch bag. I often send salad and homemade vinaigrette in my kids' lunches and I don't want those lunch bags coming back full of balsamic vinegar! 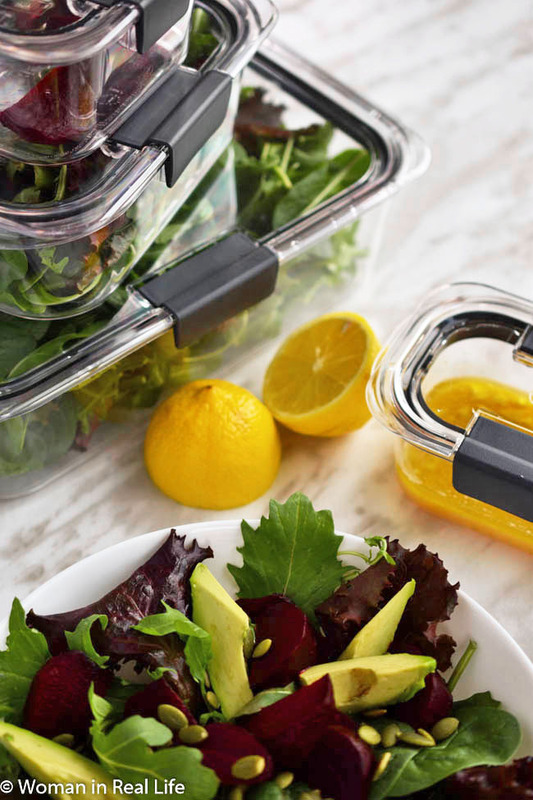 Because Rubbermaid Brilliance food storage is stain and odor resistant, you can roast extra beets and store them in a container in your fridge without worry that the container will get permanently stained with beet juice. 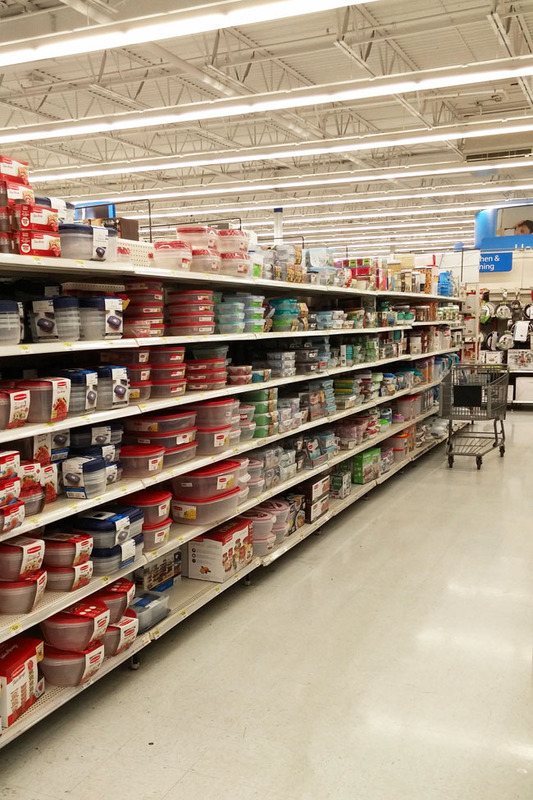 But I immediately saw the difference in terms of appearance - Rubbermaid Brilliance containers are crystal clear. I tapped a container to see if it was glass actually. On top of that, they are durable. When I got home, I dropped one right out of the package and it survived with no marks. (I tend to rush around the kitchen dropping things as I go.) The containers also have a modular design that makes them stack nicely, making them space efficient. Rubbermaid Brilliance containers have locking handles. You can hear the air being pushed out of the containers as you close them. (That's the leak-proof, airtight seal.) And the microwave vent flaps mean you can re-heat leftovers with the lid on, latches open, to avoid splatter. Rubbermaid Brilliance will appeal to anybody who is super organized or hopes to get more organized (hello!). The containers are so pretty and clear that they're actually pleasant to use. After I took the photos for this post, I ate half of the salad and stored the rest in my Rubbermaid Brilliance containers to eat the next day. The dressing did not leak from the small container I stored it in. In fact, I shook up the dressing to re-mix it right in the container. I had also stored some extra beets in a small container. I was able to simple rinse the beet juice off the container. No stain! 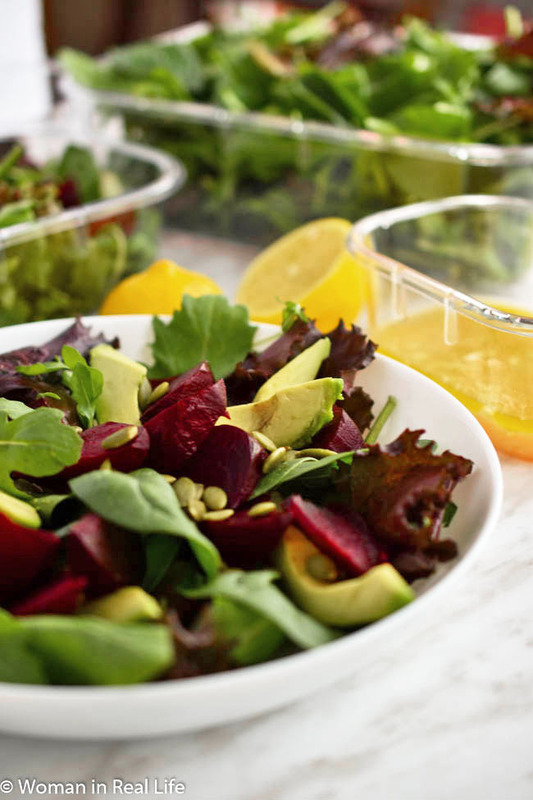 The large size container that comes in the 8-piece set is perfect for keeping your extra mixed greens fresh and the medium size is perfect for taking an individual salad to work. 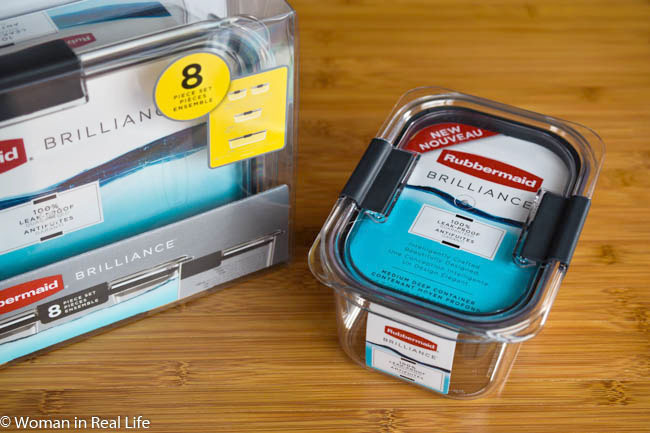 Visit Rubbermaid to find out more or head over to Walmart to see the Rubbermaid Brilliance food storage collection for yourself. Would you benefit from a better food storage system? What kinds of foods do you pack when you're on the run? What do you like to top your salads with? Wash beets. Trim off both ends. Lay beets on a sheet of tin foil. Wrap foil around beets and roast them in the oven for 45 minutes or longer, until you can slide a fork easily into each beet. 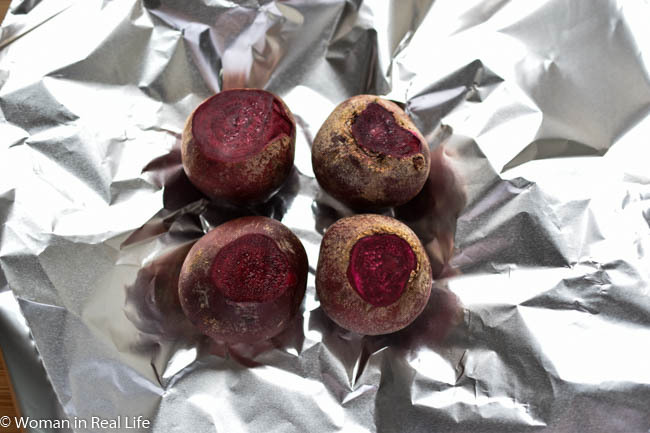 Remove from oven, open foil and allow beets to cool until you can handle them comfortably. Submerge beets in a bowl of cold water and peel off the skin. Slice into cubes or wedges. Divide greens over two plates or food storage containers. 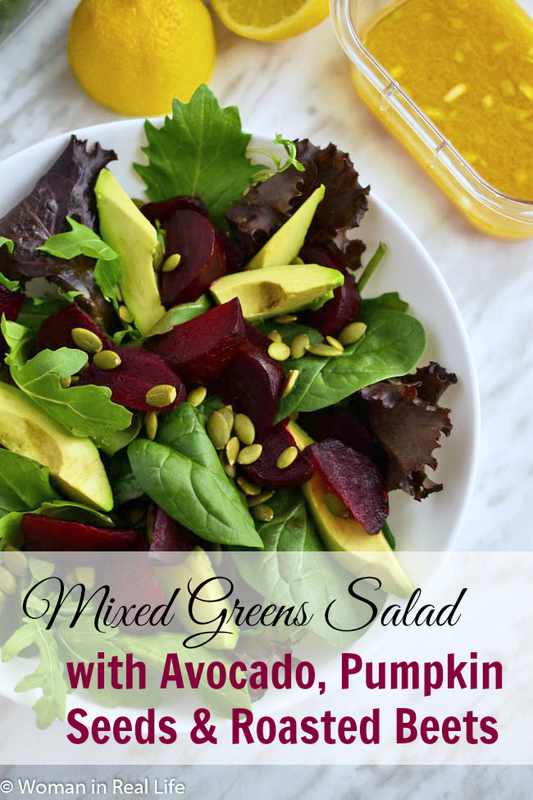 Top each plate with half of the beets, 1 tbsp pumpkin seeds and half of the avocado. This is such a great salad! I will definitely make it. Thank you Cyn! I am feeling enthusiastic about preparing beets more often! And it's awesome they don't stain these containers at all! What a gorgeous salad! I'm not a huge beet fan, but don't mind them if they are roasted. To be honest, I am not a fan of the mess of red beets so I tend to stick to golden. But I will try your handy dandy way of preparing them next time. This is not a combination I would ever have thought to put together. But I can see how the sweetness of the beets would complement the creaminess of the avocado. I love anything with beets in it and everything pictured looks delicious. oh,that looks delicious. I love beets! I love everything you put in this salad!! I have to make this! My daughter is vegan and would absolutely love a salad like this. She really enjoys beets and avocado!